This is the first essay in Code | Words, a collaborative writing project about technology in museums. Until the 1960s we thought we had a pretty good idea of what the universe was made of. You, me, the earth, the planets, the Milky Way, Renoir’s The Boating Party, the pearly plastic of Elvis’s guitar pick, the Great Pyramid of Giza, a finch’s beak, the sound of Maria Callas’ voice and everything else in the cosmos was believed to be made up of particles and energy that we could see, touch, smell, hear, or directly measure with the instruments of science. But we were wrong. Not just a little wrong; wrong at a stupendous, almost unimaginable scale. And the way in which we were wrong tells us a lot about the way our memory institutions are using technology to accomplish their missions, and the beauty and power that exists now, just beyond their reach. In 1967, American astronomer Vera Rubin, fresh out of graduate school and eager to begin her new career, started working on a comprehensive survey of the rotational characteristics of spiral galaxies. It was to be a long, grueling project: “A program no one would care about” as she herself described it—thousands of days and nights working in anonymity, gathering data to calculate the speed at which spiral galaxies spin around their dense central cores. But on Vera Rubin’s first night of observations she noticed something startling. Spiral galaxies are beautiful, enormous structures with flat, disk-like bodies that sometimes span millions of billions of kilometers and contain hundreds of billions or trillions of stars. But as marvelous as they are, they are supposed to obey the laws gravity like everything else in the cosmos; it was an article of faith that spiral galaxies would revolve around their axes like the planets in our solar system revolve around the sun, with planets closer to the center of the system spinning faster than those that are far away. But that is not what Vera Rubin found. She discovered on that night, and in every measurement that she or any other astronomer has taken since, that the outer regions of every spiral galaxy in the universe spun just as fast as their corresponding inner regions, regardless of whether the areas being measured were near the galactic axis or a hundred million billion kilometers away. It could not be so. These galaxies were spinning so fast that Newton’s laws of gravity dictated that they should have flown apart. In one galaxy, Triangulum, the outer regions were moving so quickly that it was as if there were 39 billion invisible suns—seven times the observable mass of the galaxy—quietly pulling the long, graceful arms of the system forward. Where was the missing mass? Where was the energy and the gravity coming from? How do you explain 39 billion missing suns? The universe doesn’t show its cards very often—flaunting a physical reality that so clearly contradicts the laws of nature—but there was the evidence in the hands of a junior astronomer on her first night of her first project of her first job. And there were only two explanations for what she saw: either there was something wrong with the laws of gravity, or there was an enormous quantity of invisible matter in the universe. Vera Rubin had discovered dark matter. Her measurements have now been repeated on over a thousand galaxies and the results are all the same: dark matter—whatever it is—seems to comprise most of the mass of the universe. My colleagues and I work in amazing institutions. Some of the institutions are giants, with epic missions like The increase and diffusion of knowledge (Smithsonian Institution, USA), A center for learning, dialogue, tolerance, and understanding (Bibliotheca Alexandrina, Egypt), and [To support] citizens in the defense of their rights and encourage the production of scientific and cultural knowledge (Arquivo Nacional, Brasil). Some of them are small, with just a handful of staff and quiet, humble missions that are nonetheless deeply important to the people they serve. I am talking about museums, libraries, and archives—heritage, culture, knowledge, and memory institutions—and there is really nothing like them on the face of the earth. And whether we’ve realized it or not, my colleagues and I who work with technology in these institutions have been participating in an extraordinary project — the building of a planetary scale knowledge sharing network for the benefit of everyone in the world. We’ve reached, and to varying degrees satisfied, hundreds of millions of people with our efforts, and for more than twenty years we have done it all on shoestring budgets (when we were lucky enough to have budgets at all), in direct competition with some of the biggest and most aggressive media companies in the world, through three global recessions, a global banking crisis, wars in Afghanistan, Iraq and terror (not to mention 61 other global conflicts), and at the end of the day we’ve almost always generated a positive impact on the visitation, reputation, and financial sustainability of our hallowed institutions. That’s not a bad stretch of work for what is mostly a bunch of self-taught hackers and designers who’ve been making it up as we’ve been going along. But as I look back on these accomplishments and I think of where we are today; how our institutions think about the World Wide Web 25 years after its birth, and the degree to which we understand and are taking advantage of its full capacity to serve, educate, enlighten, and empower our constituents, whoever they are and wherever they live, my thoughts return to the story of Vera Rubin and dark matter. Fast forward 40 years from Vera Rubin’s first spiral galaxy measurements in 1967, to January 1, 2007. On that day, Hank Green, an environmental writer and web consultant living in Missoula, Montana, uploaded a YouTube video in which he bet his brother, writer John Green, living in New York City, that they could go an entire year without texting, sending email, or exchanging written words with each other, in any form. Instead, Hank proposes, they will communicate only through YouTube. They call the effort Brotherhood 2.0 (“365 days of textless communication”) and you can see a short mashup of their first two messages, as well as links to the entire oeuvre of Brotherhood 2.0 videos, here. These are not high-tech productions and Hank and John Green are not movie stars. It is evident from watching 30 seconds of any of their videos that they are nerds, and they proudly describe themselves as such. If you announced to your museum director or boss that you intended to hire Hank and John Green to make a series of charming and nerdy videos about literature, art, global warming, politics, travel, music, or any of the other things that Hank and John make videos about you would be thrown out of whatever office you were sitting in and probably be asked to find another job. But over the course of the 1,000-plus Brotherhood 2.0 videos recorded to date, Hank and John Green—or the Vlogbrothers, as they’ve titled themselves and their YouTube channel (a vlog is a video blog)—demonstrate an exquisite mastery of the dark matter of the Internet. They didn’t start by making a website. They didn’t develop a mobile app. They didn’t have a marketing budget, a content review committee, or a brand strategy. They sat down in front of their cameras and started talking about the things that interested them, and in the process, they got to know their audience. Their work is social, graceful, spontaneous, humble, funny, creative, humane, and generous. And from the perspective of formal institutions, used to working with professional content developers, actors, videographers and web developers, it all looks like a joke. But look at what happens over the course of the years as the brothers Green move their experiment forward. They create the Vlogbrothers YouTube channel. They discover that people are interested in what they do, and they start interacting with their followers. They start referring to their followers as nerdfighters—nerds who fight “to reduce worldsuck,” i.e., bad things in the world. They begin noticing that the nerdfighters are interested in social causes. They incorporate the Foundation to Decrease Worldsuck, Inc., a Montana based 501(c)3 charitable organization, to receive and re-distribute the charitable donations of nerdfighters. They create the Project for Awesome, an online film festival in which nerdfighters submit short YouTube videos promoting their favorite charities. In 2013, the Project for Awesome raised $869,146 for the Foundation to Decrease Worldsuck, which then redistributed the money to charities chosen by the nerdfighter community. They begin talking about Kiva, a non-profit microfinance organization that lets individuals make small, short-term loans to low-income entrepreneurs around the world. The Nerdfighters respond, and to date, the nerdfighters Kiva group has made over 133,000 loans totaling almost $4 million. Hank Green, noticing that there was no gathering for creators and fans of YouTube videos, starts the VidCon conference. In its first year (2010), VidCon sold out its 1,400 seat venue at the Anaheim Convention Center. John and Hank sell out Carnegie Hall for an event titled “An Evening of Awesome” in 2013. To sustain Crash Course after the Google grant ran out, they create their own crowd-funding platform Subbable. Subbable allows people to support ongoing creative projects with small monthly donations—including donations of $0. (John Green: “Because people who are struggling financially have enough trouble in their lives without feeling that they can’t fully be part of something that matters to them, simply because they don’t have money.”) Within a week of Subbable’s launch, it had more than $30,000 in monthly subscriber pledges, and more than $70,000 in total payments. They create DFTBA Records (“Don’t forget to be awesome”), an online store that features fan merchandise designed by and for nerdfighters. John’s behind-the-scenes collaborator and wife, Sarah Urist Green, a curator at the Indianapolis Museum of Art, creates The Art Assignment, a YouTube channel (produced by the Public Broadcasting Service’s Digital Studios) in which Sarah and John teach people about the concepts of contemporary art by challenging viewers to create, share, and discuss their own works and experiments. The Art Assignment has been running for two months and has 74,941 subscribers and 805,801 views. The Vlogbrothers network of 26 channels (just stop and think about that for a moment: two nerds built their own network, with 26 channels in it) has 6.8 million subscribers and has received almost 805 million views. They have 106 times more views and 759 times more subscribers than the Louvre’s YouTube channel. Note that the Louvre is the most visited museum on earth. To summarize: in seven years, two lovable nerds used YouTube and their own creativity to build what amounts to a vast educational content community that any museum or cultural institution on the planet would be proud to call their own. They’ve got millions of avid followers, they’ve helped give millions of dollars to charity, they’ve elevated and sustained a discourse about culture, science, thought, suffering, and existence—and they’re having a blast and making people happy. They—two nerds— did this in seven years. I’ve been on website redesign projects that lasted seven years. I’ve been on committees that took seven years to write a report. You’ve probably never heard of the Vlogbrothers or Brotherhood 2.0. Hank and John Green are working in, and they’re part of, a kind of Internet production—a kind of interaction—that is difficult for institutions to think of as legitimate, sufficiently respectable, educational, scholarly, or erudite. But it seems that the public doesn’t care. It’s likely that the public doesn’t think of what memory institutions often do as being sufficiently accessible, smart, joyous, attentive, generous, welcoming, imaginative, bold, educational or meaningful to merit much of their attention. In the 1990s, researchers from the Urban Institute conducted a study of arts and culture participation in underprivileged communities in Oakland, California. When they surveyed local residents to find out where they got their culture, they were met with blank stares and a general reply of ‘we don’t have that kind of stuff around here.’ But when researchers returned a few months later and asked the question a different way; ‘Who are the creative people in your community?’ they received an outpouring of information about the artists, musicians, writers dancers, and other creative people who lived nearby. The problem wasn’t a lack of culture in the community, it was that people weren’t associating their creative lives with the galleries, museums, concert halls, and other formal arts institutions that were created and operated on their behalf. This is not just a matter of the glass being half empty or half full. The disconnect here is that the glass—the Internet and the dark matter of open, social, read/write culture—is so much bigger than we are accustomed to seeing and thinking about. The glass is huge, and it keeps getting bigger, every day. In Cognitive Surplus, Clay Shirky asserts that among the educated, Internet connected inhabitants of planet Earth, there are 1 trillion hours of free time every year that could be used for community action, civic engagement, and learning. But when Shirky published Cognitive Surplus in 2010 there were only 2.1 billion people online. Almost a billion people have joined the Internet since then. In The New Digital Age, Jared Cohen and Google chairman Eric Schmidt predict that another 5 billion people will come online in the next decade. Even using the gigantic numbers that astronomers use to describe the universe, its difficult to comprehend the combined cognitive abilities, expectations, and desire for learning, participation, and self-improvement that 6, 7, or 8 billion people on the Internet might have. This is a critical issue that institutions will be contending with for decades to come: There’s just an enormous, humongous, gigantic audience out there connected to the Internet that is starving for authenticity, ideas, and meaning. We’re so accustomed to the scale of attention that we get from visitation to bricks-and-mortar buildings that it’s difficult to understand how big the Internet is—and how much attention, curiosity, and creativity a couple of billion people can have. Reddit had over 109 million unique visitors last month, and an astonishing 5.3 billion page views. This is not simply lowbrow entertainment; the top Reddit “Ask Me Anything” discussions have been with Barack Obama, Sir David Attenborough, and Bill Gates. In 2013, recording artist Moby distributed his latest album as an openly licensed BitTorrent Bundle. TechDirt reported that he “got an astounding 8.9 million downloads of his offering — with 419,000 of them agreeing to join his mailing list and 130,000 of them going over to iTunes to the album (many of which likely resulted in sales).” Fans have created more than 68,000 remixes of his songs. Tumblr: 185.4 million blogs; 83.1 billion posts. That’s all I’m going to say about Tumblr. In two years, Pinterest has grown from a concept to serving 10s of billions of page views a month. As of April, 2014 they were reported to have 30 billion pins on 750 million boards. People upload 1.2 billion photos to the top four mobile social sites every day. TED served its billionth TED talk video in 2013. The Kickstarter community gave away its 1 billionth dollar to support new creative projects in 2014. Among the projects supported was the delightful Mini-Museum by Hans Fex. Mr Fex’s fundraising goal was $38,000: he raised $1.2 million from over 5,000 backers. Wikipedia and the Wikimedia projects have received over 2.1 billion edits from users. The Khan Academy’s art history website Smarthistory served over 2 million learners from 200 countries last semester. The Khan Academy itself reaches more than ten million learners a month with its free online classes. MIT’s Open Courseware project served 100 million people in its first decade and their goal is to reach 1 billion learners in the next ten years. What makes these sites tick? For many of them, it’s a strategy of openness and generosity—a genuine respect for, interest in, and admiration for the people who participate. It’s an ongoing commitment to listening, respect, and empathy that manifests itself in every decision and strategic choice, and which benefits both the participants and the convener. TED founder Chris Anderson puts it this way. So, at TED, we’ve become a little obsessed with this idea of openness. In fact, my colleague, June Cohen, has taken to calling it “radical openness,” because it works for us each time. We opened up our talks to the world, and suddenly there are millions of people out there helping spread our speakers’ ideas, and thereby making it easier for us to recruit and motivate the next generation of speakers. By opening up our translation program, thousands of heroic volunteers — some of them watching online right now, and thank you! — have translated our talks into more than 70 languages, thereby tripling our viewership in non-English-speaking countries. By giving away our TEDx brand, we suddenly have a thousand-plus live experiments in the art of spreading ideas. And these organizers, they’re seeing each other, they’re learning from each other. We are learning from them. We’re getting great talks back from them. The wheel is turning. But is a TED talk as good as a museum visit? Is any online experience as good? The open, social, and collaborative platforms of the read-write web make projects like Svegliamuseo and Alexandra Korey’s Ufizzi app and e-book inevitable, and even the largest, most brilliant institutions can not match the wit and energy of their followers, particularly when those followers are part of a network that connects more than a third of humanity. We should expect to see countless thousands of projects like these as the Internet continues to grow, platforms become more powerful and easier to use, and citizens become more confident in their abilities to challenge, help, and even surpass the accomplishments of what have previously been sacrosanct institutions. Our choice will be whether to ignore or discourage these people, compete with them, or dedicate ourselves to ensuring their lifelong success. Until recently, we thought we had a pretty good idea of what museums were made of. Museums — and with them libraries, archives, and cultural and educational institutions of all kinds—were made of buildings, collections, staff, and visitors: things we could see, touch, smell, hear, or directly measure by counting tickets sold and people through our doors. But we were wrong. Not just a little wrong. Wrong at a stupendous scale. Like the universe before Vera Rubin discovered dark matter, we were seeing only the small percentage of cultural activity that we expected to see, where we expected to see it. But we know more now—there is more now—and it’s tremendously exciting to think about what we can accomplish if we begin to work with true conviction in the areas of the Internet that are less familiar to us and more familiar to our visitors. Museums, libraries, and archives—heritage, culture, knowledge, and memory institutions—can play a huge role in the story of how Earth’s 7 billion citizens will lead their lives, make and participate in their culture, learn, share, invent, create, cry, laugh, and do in the future. It is often forgotten that Tim Berners-Lee designed the World Wide Web to have a remarkable central characteristic: everyone who joined would automatically be granted the right to both consume and produce—to read, and write—on equal footing with everyone else. “The idea was that anybody who used the web would have a space where they could write, and so the first browser was an editor—it was a writer as well as a reader,” said Berners-Lee. “Every person who used the web had the ability to write something.” The entire architecture of the World Wide Web is based upon these humanistic, democratic ideals, and we can do a lot of good with them if we make wise choices and concentrate our efforts where they’ll matter the most. I’ve put notes and links here at the bottom to keep the text clean. If it winds up being too weird or difficult for readers I’ll put them back up in the body of the story. Links to slides and videos from conference presentations are at the bottom. Vera Rubin: Bright Galaxies, Dark Matter, by Vera Rubin, American Institute of Physics, New York, 1997. I’ll note that the physics of dark matter, and the history of its “discovery” are, of course, more fascinating, challenging, and nuanced than I’ve depicted here. Astronomer Neil DeGrasse Tyson has said that he doesn’t even think we should call dark matter matter, because it’s so weird and inexplicable (link). And it’s an oversimplification to say that Vera Rubin “discovered” dark matter—rather, her observations (and the work of others, back to the 1930s) seem to indicate its existence. “Tim Berners-Lee designed the World Wide Web”: Berners-Lee on the read/write web, August, 2005, http://news.bbc.co.uk/2/hi/technology/4132752.stm. I’ve altered the punctuation of the original quotation in the article to emphasize “—it was a writer as well as a reader” with the m-dash. I think it’s clearer this way, and since the BBC was transposing Sir Tim’s words into prose I think it’s ok to adjust the quote in this way. 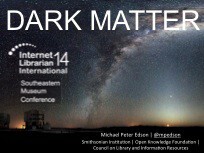 Dark Matter (video) opening remarks for J. Boye conference, Aarhus, Denmark. Co-founder, Museum for the United Nations — UN Live. Writing The Age of Scale. Tech, civics, democracy, open knowledge. The Future.